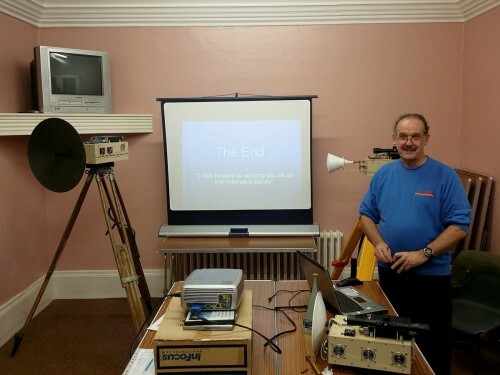 47GHz – Havering & District Amateur Radio Club. Thanks to Chris, G0FDZ for giving a fascinating talk to the club this Wednesday on the microwave bands. Chris is one of the few amateurs in the UK that is operational on the bands up to 241GHz, what he calls the other ‘Top Band’. On display were three of his homebuilt transverters, some of which are dual band capable, covering in total 24GHz, 47GHz, 76GHz, 134GHz and 241GHz. All using an FT-817 as an IF. Chris, G0FDZ and his microwave equipment. The Weather, he cometh. Alan Paul – G3RJI talks weather and weather stations. Havering ARC was at the Canvey Rally. * Frequencies subject to availability. Find us usually between 145.450 and 145.550 MHz. † All times are local time. © 2016 Havering & District Amateur Radio Club.